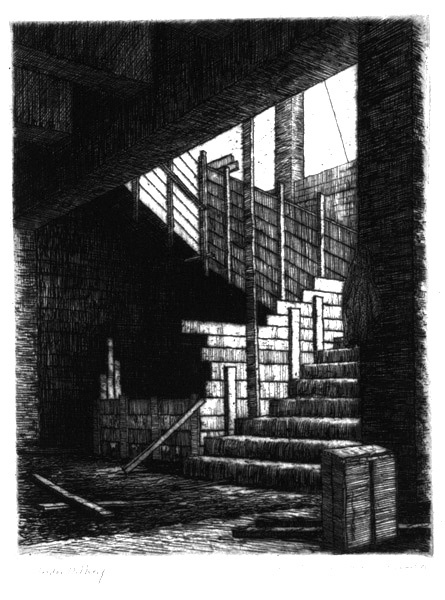 Contributing artists: Arthur Runquist, Albert Runquist, O. B. Dawson, Frederick A. Baker. 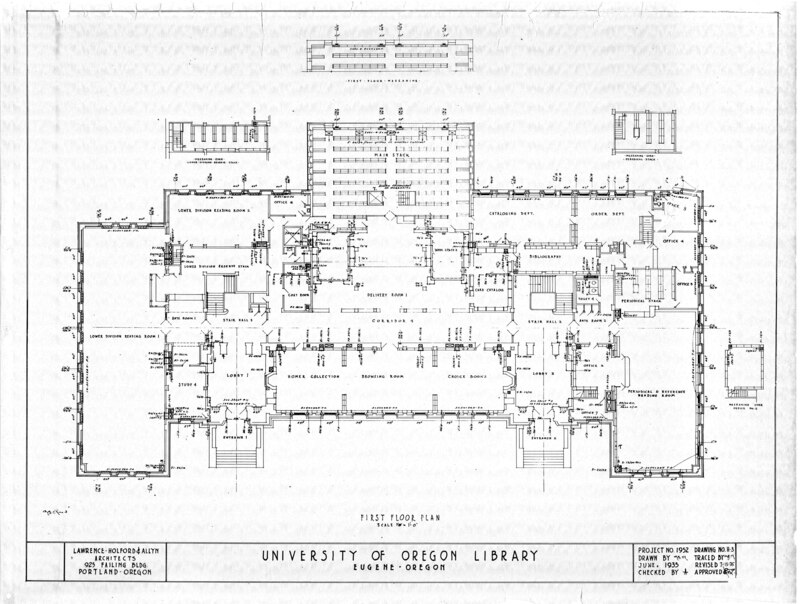 In the east stairwell of the historic Knight Library can be found the murals commissioned for those locations as well as the decorative ironwork designed to memorialize UO president Arthur Bennett Hall. West stairwell, Knight Library. Mural: Mission of a University. In the main hallway, three tall, square-headed entryways in the south wall give access to the circulation lobby. They are framed by decorative metal gates, commemorative in nature, which are fashioned of stylized floral and scroll motifs. The main hallway, circulation lobby, stairwells, and second floor stairwell halls are walled with warm Minnesota Kasota stone over structural hollow tile blocks. The stair treads and hallway floors are travertine marble. The ceilings are surfaced with acoustical tile, and the remaining floors are covered with rubber tiles. These surfaces were chosen to eliminate the noises caused in the circulation areas. Most of the art deco and large globelike ceiling light fixtures throughout the Library were designed by Frederick Baker of Portland, and some remain in their original placement. In the main corridor, the circulation lobby, can be found the Arnold Bennett Hall Memorial Gates. The walls of the stairwells are Minnesota Kasota limestone placed over structural hollow tile blocks. The stair steps are made of travertine marble. On the south walls of each stairwell are windows of leaded glass with the colored glass embedded in designs of geometric shapes. These windows give some illumination to the murals on opposing walls of each stairwell. 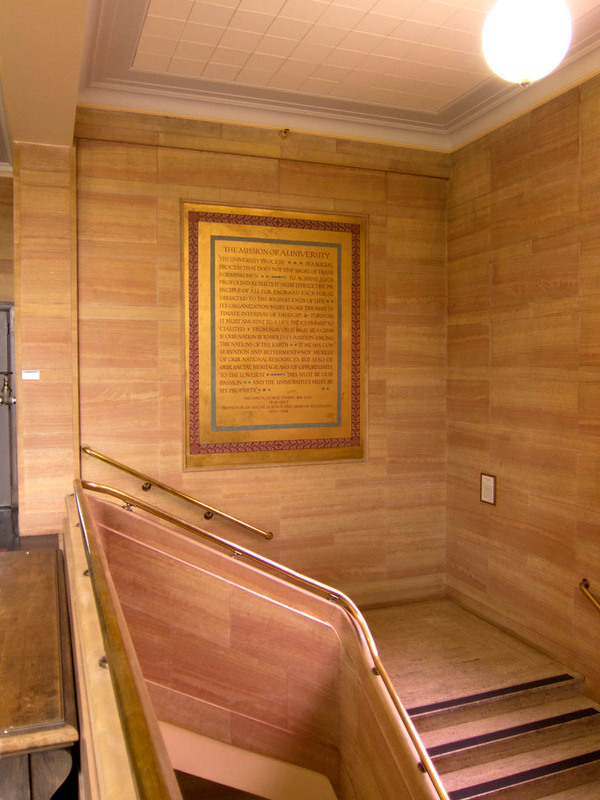 The stairwell murals are painted on canvas which was affixed to the niches designed for them. The murals Opportunity for the Youth of Oregon and Development of the Arts are located in the east stairwell. In the west stairwell can be found the murals Mission of a University and Development of the Sciences. Douglass, Matthew Hale. The University of Oregon Library Building. 1937. Evans, Lew. "Art Work in New Library Product of Delicate Work by Grads and Professors." Oregon Daily Emerald, May 19, 1937. The two hand-lettered murals by N. B. Zane are described and it is noted that the Runquist Brothers are working on the larger spaces. 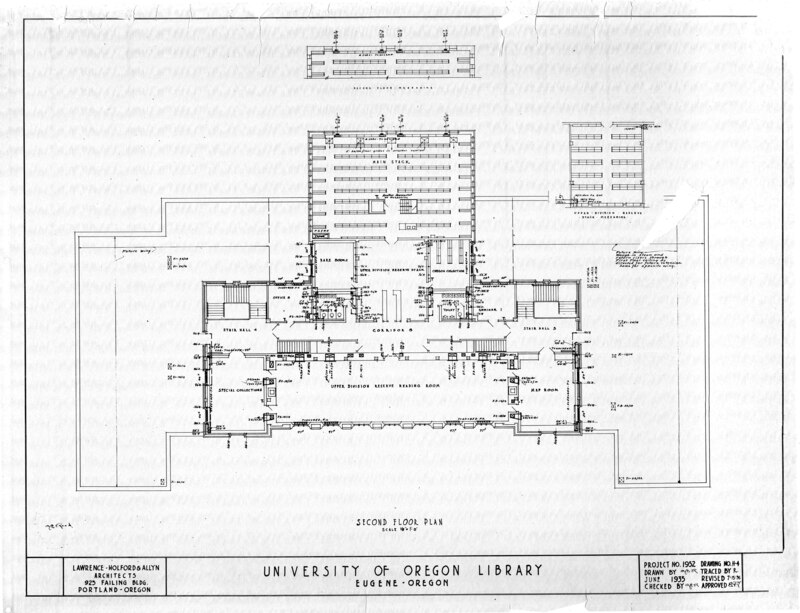 Emerson, Kim, "University of Oregon Library and Memorial Quadrangle," National Register of Historic Places Registration Form, August 15, 1989. 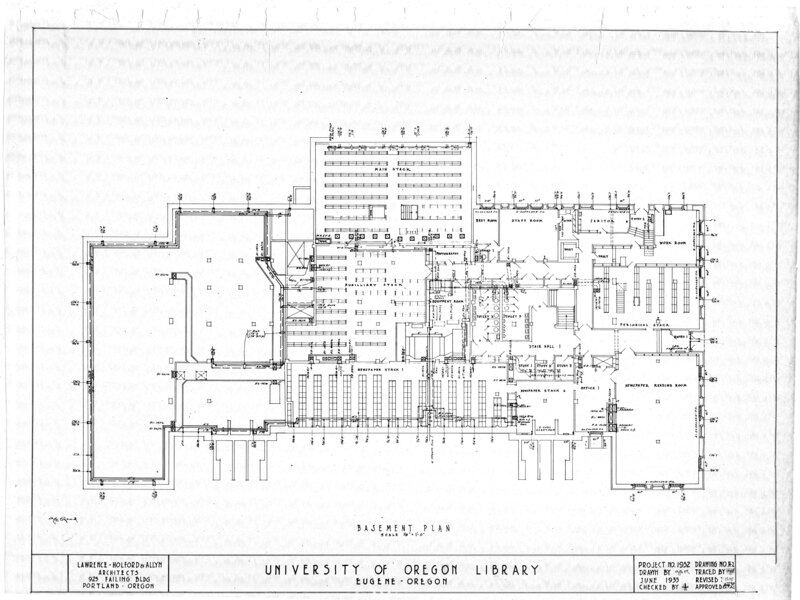 "The Library," Ellis Lawrence Building Survey. v.2 (Eugene). Compiled by the Historic Preservation Program, School of Architecture and Allied Arts, University of Oregon ; project directors, Michael Shellenbarger, Kimberly Lakin. [Salem, Or.] : State Historic Preservation Office, . A digital version is accessible in Scholar's Bank.